Stay snug with these super-soft socks crafted from alpaca wool. In the Peruvian Andes highlands, where hot, sunny days are followed by freezing nights, alpacas stay comfortable thanks to the unique thermal properties of their super-soft, silky fleece. Less bulky yet twice as warm as sheep wool, durable alpaca wool wicks away moisture and is naturally lanolin-free, non-scratchy and far less allergenic. Also? It makes stylish accessories. 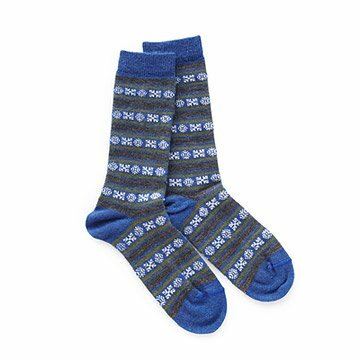 Warning: Snug and toasty in these geometric snowflake-striped socks, your ecstatic feet may feel an unprecedented need to prance. Hand-knit by Peruvian artisans. Love them! Soft and warm! They were exactly what I wanted for my daughter. They were pretty but most important, soft and comfy.